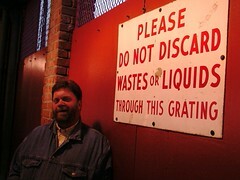 Luther Ingram lost his long battle with diabetes and kidney failure this past Monday, March 19th. 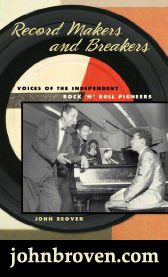 A giant of seventies Southern Soul, his enduring contributions to the music will live on forever. Born in Jackson, Tennessee, Luther sang with his brothers in the Midwest Crusaders before venturing north to New York in the early sixties. 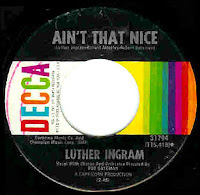 He reportedly worked with Jerry Lieber and Mike Stoller before recording a one-off single for Decca, Northern Soul favorite Ain't That Nice in 1965. He next recorded a song he wrote called I Spy For The FBI on Smash, which would later be covered by Jamo Thomas. 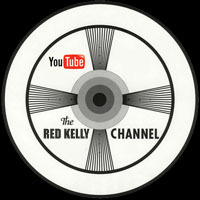 After a couple of other minor singles failed to hit, he signed up with Johnny Baylor's KoKo label. When Baylor moved his base of operations down south to Memphis, working out a distribution deal with Al Bell at Stax in 1969, Luther went with him. There are many horror stories told about Johnny's strong-arm tactics (some of which are detailed in the great Soulsville, USA), but there's more to it than that. As Luther put it himself; "He was a coach. He taught me. Baylor was determined for me to show the world and the industry and Stax Records and everybody else that I was a great talent. That was his concept of me." After a showdown with Isaac Hayes over production, Baylor took Luther down to Muscle Shoals Sound in 1972 and did precisely that. The phenomenal (If Loving You Is Wrong) I Don't Want to Be Right would spend a month at number one R&B that summer, even climbing as high as #3 on the Hot 100. Luther Ingram had arrived. His smokey, emotional delivery was the perfect vehicle for what, in my opinion, is the greatest of all those seventies 'cheatin' songs... it's deep, man. 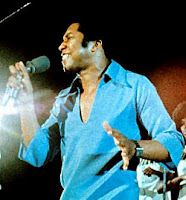 When he appeared at Wattstax in August of 1972 he was, at that moment, the brightest star the company had. His follow-up single I'll Be Your Shelter (In Time Of Storm) hit the R&B top ten (top 40 Pop), and mined the same romantic territory. 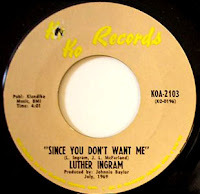 The crankin' tune you're listening to now was released as the B side of that record, and features Luther just beltin' it out, while showing off his great songwriting skills at the same time (he had already co-written Respect Yourself with Mack Rice the year before). Baylor's funky production of the crack Muscle Shoals team here is just flawless. Wow! 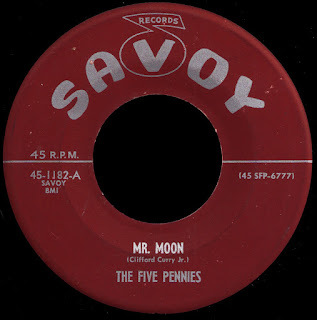 Two more top 40 singles would follow but, by late 1973, Johnny Baylor's problems with the IRS forced him to close down KoKo for the next three years. 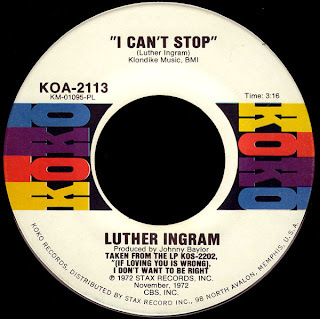 Once he returned, Ingram was right back in there with great records like Let's Steal Away To The Hideaway and Do You Love Somebody hitting big in the latter part of the decade. Later releases on Profile in the eighties hit the charts as well, and he remained a huge attraction until falling ill in the 1990s. 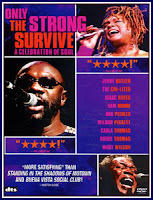 The remarkable documentary Only The Strong Survive was filmed, in part, at a 1999 benefit concert organized to help defray the costs of Luther's much needed kidney transplant. He was universally loved by all who came in contact with him. Our heartfelt condolences to his loving wife, Jacqui, and the rest of his grieving family. May God Rest His Soul. Always. The song you posted is actually James Brown's "Santa Claus Is Definitely Here To Stay." Sorry, man... the player had the right track, but somehow I messed up the download link... thanks for the heads up, bro! Not to mention his Profile album of the 80s. 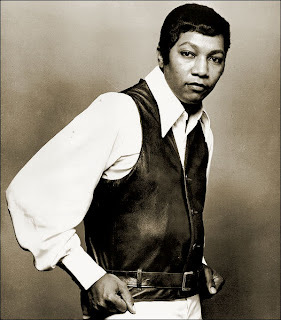 Johnny Baylor was a fascinating character...writing and producing some great songs, coaching and managing Luther, more or less running Stax at one time...and using dubious practices when it suited him.